Ridgewood Masonic Temple is giving it up to become an apartment building. The mysteriously beautiful building on 1054 Bushwick Ave in Bushwick has been approved for a total of 28 rental apartment units according to the plans submitted to the the city's Landmarks Preservation Commission. Now before the construction begins, here's a list of things to remember about 1054 Bushwick Avenue and its pre-apartment age. It's okay to cry. 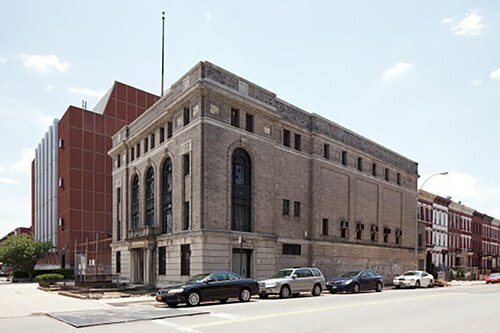 The prominent building of the Ridgewood Masonic Temple reveals its age in its name: when 1054 Bushwick Avenue was constructed in the early 20th century, it was definitively in Ridgewood. Today, we know it as the Bushwick. 2. 1054 Bushwick Ave is the only neo-classical, Beaux-Arts building along Bushwick Avenue. Some identifiers of neo-classical structures are symmetry, arched windows, and flat roofs. The Metropolitan Museum of Art, built 18 years prior to the masonic lodge, is another much more well known Beaux-Arts structure in the city. 3. Ridgewood Masonic Temple was built by the Koch & Wagner architecture firm between 1919-1920. The duo was responsible for several churches and commercial buildings in Queens and Brooklyn as well, yet they were mainly touted about for their bank buildings. East Brooklyn Savings Bank was built in the same neo-classical style that the masonic temple was and today exists as a Chase bank. 4. Ridgewood Lodge #710 is the proper name for the structure. Free and Accepted Masons is the proper name for the group who occupied it. A union of three lodgers came together to form #710: Ridgewood Lodge #710, Cypress Hills Lodge #1064, and Star of Hope Lodge #430. 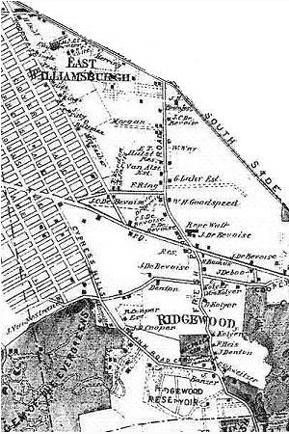 Ridgewood Lodge first met at 943 Gates Avenue on September 28, 1870. RW Henry W. Turner was grand master. Though this seems like a series of facts, keeping track of significant dates is vital for legacy. 5. Masonry was founded in the Middle Ages and is one of the oldest fraternal organizations in the world. As the group gained footing in the US, by the 20th century most Americans lived within considerable distance from a masonic temple. At the time of Ridgewood Masonic Temple’s construction, the corner of Bushwick Avenue and Gates Avenue was a highly regarded, prestigious lot. The decision to build there was par for the legacy of fraternal building placement. This vector image was created with Inkscape.. Licensed under CC BY-SA 3.0 via Commons. 6. The Ridgewood Lodge disbanded in the 1970s to the Astoria Lodge in College Point, Queens as per a decline in membership. The building has been largely vacant since this point in time until 2010. Brainchild of newly re-opened Market Hotel and a famed indie music promoter Todd P threw there massive events with the likes of Sleigh Bells, Vivien Girls, Dan Deacon, Das Racist, and many many more. Check this Halloween party to see what kind of fun Bushwicksters had back then, scroll through the photos and maybe find yourself in one of them if you've been hanging here for awhile. Building manager Frank Williams didn't obtain a liquor license in time for an event he threw in 2010, and when the cops showed up the decision was made to deny the space option to obtain any temporary liquor license in the future. Long story short, the debacle forced Todd P to reschedule the location for his next NYE 2010 bash to 285 Kent, where the space could sell alcohol. The usage of Ridgewood Masonic Temple as an event space fizzled out with the dry ruling and hasn’t been occupied since. “If we don't sell alcohol, we can't pay for the place,” said Todd to BushwickBK. 9. The building was first put up for sale in 2010, while it was still an event space, asking $1M. At that time, there were no bites. Many at the time hoped that the spaced would have a similar future as a full time event space. The city Landmarks Preservation Commision unanimously voted in July 2014 to declare 1054 Bushwick Ave a landmark. The decision took into account the building’s place in Brooklyn, as well as in American history. Like the Arion Singing Society nearby, Ridgewood Masonic Temple held a ground breaking presence in a part of Brooklyn which was urbanizing its rural landscape. The area we umbrella under Myrtle-Broadway and on eastward experienced a mass influx of German immigrants. After residential buildings went up, the construction for civic and institutional buildings was indicative for creating a rich community. 11. Lodges and Chapters of the Second District Inc. -- the masons -- sold the building to Yoel Wertzberger in September 2014. Up until very recently, there has been a wait for the approval by the city Landmarks Preservation Commission. Currently the LPC staffers and the architects are figuring out how to go about adding and restoring the windows without rupturing the Beaux-Arts facade. 12. Stanley Kubrick’s film Eyes Wide Shut is thought of as a possible interpretation of what (else) went on in masonic temples. In the film, Tom Cruise’s night of spontaneity leads him outside NYC proper to a massive gathering of a hooded cloak wearing, masked society--all having orgies in a kind of symphony. There’s no way of knowing that the masons over at Ridgewood Lodge #710 didn’t participate in these sexual activities on their premises. The lack of windows is totally in their favor, yet all we can do is speculate and imagine wildly at our leisure. Kubrick tragically died less than a week after finishing the script, which if you've seen the movie that is quite spooky in itself. 13. Ridgewood Masonic Temple has currently only one review, and it's four stars. It begins, "I'm not sure how one reviews this edifice . . ."